Do you feel the strength of your personal relationships has a lot to do with your well-being? I am pretty sure most would nod in agreement to that! After all, those relationships are our lifeline! Where would we be without those special people we share our lives with? Those relationships do require tending, though, and communication is key to having good quality ones. Healthy, meaningful relationships play a huge part in living a healthy lifestyle, so, lets put in the effort and do a little self-check to see if we are doing our best when communicating with those important people in our lives, shall we? Being a good communicator is more about being a good listener than anything else, I think. If you have that down, you are more than halfway there to being a great communicator and enjoying stronger relationships and better health (study here). And, besides, there are few things that illustrate how much you care about someone than when you take the time to listen to him or her — really listen, that is. 1. Show that you want to be there. Even if your day is the most hectic ever and you can only give the person 30 seconds, make those 30 seconds count. I would rather have 30 seconds of someone’s attentive attention rather than 30 minutes of the person scanning the room, looking at his or her phone, gazing out the window. You get the picture. So, let’s put down our gadgets, papers, a book — all those distractions — and be there. 2. Let them see the color of your eyes. In many cultures, eye contact is a big visual cue that we are listening. But, I say, look at whoever is speaking to you, even if he or she is not looking at you. This is so important with children, too. Stoop down, if you must, to show them your eyes and the understanding behind them. Besides, if we don’t, a message of uncertainty, guilt, lack of confidence or worse, indifference can be conveyed even if we are not feeling that way. A full dead-on stare isn’t a good idea either, though. That can carry an intensity you may not want to display either. So, no staring but show ’em some love with your eyes. 3. No jumping in. Jumping to conclusions, I mean. Give the person a chance to finish his or her thought or idea. Don’t judge quickly or mentally criticize. If you let them finish the thought, you may learn you are on the same page after all or even better . . . learn something new! 4. Take a pause. Find the natural break in the conversation before responding with either your thoughts or a question. This one is tough for me as I tend to have a lot of questions! But, many times, I have noticed, if I pause and let the speaker finish, the questions get answered as the person was allowed to explain fully. Besides, interrupting too much can say, “My thoughts (ideas, solutions) are more important (better, more interesting) than yours!” I bet that is not the message you want to send. If you are dealing with a slower talker or someone formulating their thoughts organically as they are speaking, give it a chance. A great idea may be in the making. This is especially true for children and teens and your patience and respect teaches them to be good listeners as well. 5. Walk beside them. Maybe this is the most important aspect of great listening and communicating. A good listener walks beside the speaker and puts themselves in the speaker’s shoes and situation. Empathy for the speaker is critical to truly understanding the viewpoint or experience described. Your facial expressions, your words, and your questions all show empathy. Even a simple nod, a smile, laugh, even a tear (all sincere please!) help with that. Your follow up questions are important, too, to show you are listening to what they are saying. Engaging in meaningful conversation with someone you care about showing understanding and connecting with your speaker is the ultimate relationship enforcer. Mentally and emotionally walking along with the person as he or she speaks allows you to experience what the person is describing, feeling and allows for clarification of something you were perhaps not understanding very well. Of course, there are many other tips and ways to show your attention to those that are speaking, but if you can remember the basics suggested here, you should be on your way to conveying the main message – you care about them and what they are saying! Care to add anything here – any suggestions for better listening and communications with others or a story about how it went well . . . or maybe not so well. Please do in the comments! Getting a little hot under the collar? Here are some ways to deal with anger a lot better. Meeting someone for the first time. Let these tips help. 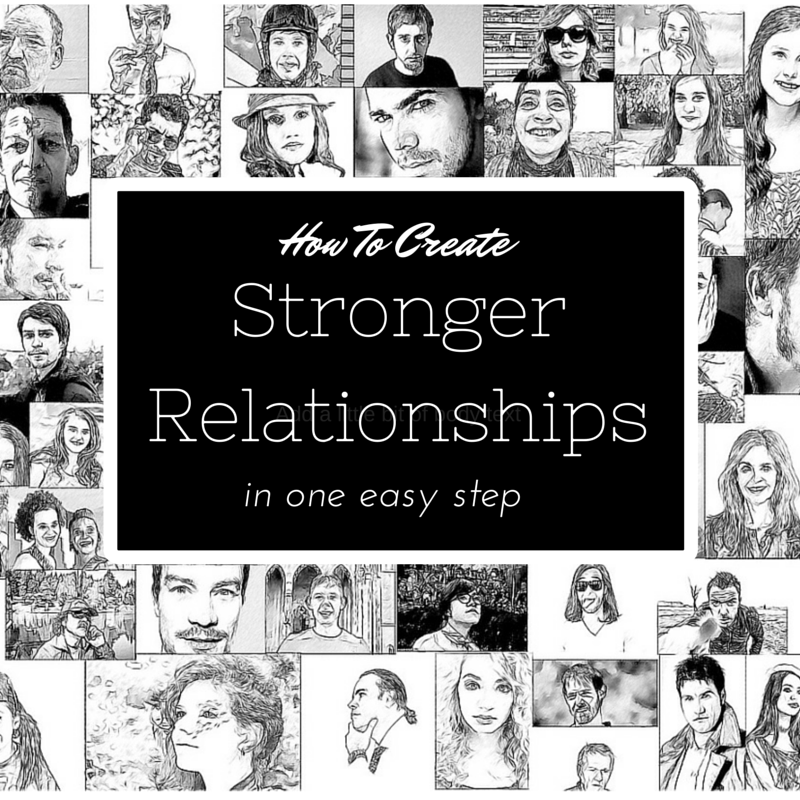 These are such helpful insights regarding creating and maintaining strong relationships. It is not always easy, so suggestions like these are very important to keep in mind when communicating with others. Thank you so much for sharing these tips for creating stronger relationships with us at the Healthy, Happy, Green and Natural Blog Hop. I'm pinning and sharing. Thanks, Deborah. You are right that it is not always easy but so, so worth it! Stopping by from the #wowlinkup and these are great tips. I hope I'm a good listener except with the hubby LOL. I'm glad you did stop by. Always great to hear from you and give us a laugh! Glad they resonated with you, Jenny! Happy Easter to you as well. Spot on! Important and helpful post. The key to a sustainable relationship is good communication. Talk and listen during both ups and downs. I pinned your great advices. Thank you for sharing! Thanks, Charlotte! I appreciate that. Yes, communication is key! Two very good points you made here! Relationships do take time and effort (some more than others, huh?!) but when we are able to connect and have better understanding, it can't be beat! Always love to hear what you have to say and I appreciate your great comments. Great tips! I think listening is so important. Most people are usually just waiting for their turn to talk, rather than actually listening. Yes, it is hard to not want to bounce right in and interrupt, but listening first can do wonders! Thanks for always coming by and adding your thoughts, Dannii. Happy to hear you found them so, Marissa. Thanks for coming by. These are such important points. One variation, based on my experience with a close friend of my daughters', who is blind. For someone visually impaired, where eye contact isn't an option, touch is a wonderful substitute. I always make sure that my hand is touching hers when we talk, but in such a way that she can pull away if she wants. I truly believe that's part of the reason that she and I are closer than she is to the parents of other friends. Such an excellent point, Sadie. I love that – touch is nice, too. I bet your daughter's friend does appreciate your approach! Thanks for adding in with such a great angle. It absolutely does all weave together, Gingi, to create a healthy lifestyle. So glad you get that here at the blog! Yes, distractions can hurt us, Launna. Happy to hear you liked the article and for telling me so. Please come back again and let us hear your thoughts. No jumping in is a huge one. I often want to interject with my thoughts, advice, etc, but it's best to let the other person finish their story first. Agreed. Try and find the best break and let the speaker finish his or her thought! Thanks for taking the time to comment, Carmen. Communication is really the key to every successful relationship, especially the bit you mentioned about eye contact. I struggle with this personally! No clue why but I need to be able to do better with this. Overall, I would much rather listen than speak. Not a big talker here. And the gadgets need to go, especially those cell phones, bah. So true, Laura! The gadgets do create a barrier. So glad you came by!